I think it is human nature to compare yourself to others. As kids we compared ourselves to an older sibling or cousin. It motivated us to get out of our comfort zone, try new things and reach new heights. Comparing yourself to others can be a double edged sword, though. Used the right way, it can be a beautiful thing, but done improperly it can cause unnecessary anxiety and leave you feeling inferior. If you sit in a teachers lounge for any length of time, you are sure to hear “How did your class do on the Dibels/Maps/Benchmark test?”. This conversation can have a positive outcome or a negative outcome based on how the person asking the question uses the information. Positive outcome: If the other teacher’s students scored higher in an area, ask the teacher for ideas and strategies to use with your students. Most co-workers are happy to help because teachers by nature love to help. Negative outcome: Make excuses (my parents don’t help my students as much hers do) or feel like you are a less capable teacher (if I was better at teaching XYZ my students would score higher on this test). There is usually a solution for most of the excuses you can name. Are your parents uninvolved? Find a teacher in your school who does have involved parents and ask him/her for suggestions to get yours more in tuned with what’s going on in your classroom. Here are some more ideas for involving parents. Does incorporating technology/teaching XYZ give you hives? Ask your principal to send you to a workshop. Remember, knowledge is the road to your comfort zone. My first few years of teaching I could have won an award for comparing myself to my fellow colleagues the wrong way. I hope you can learn from my mistakes. You’ve probably seen this same scenario play out at your school. Teacher A and Teacher B have the same years of experience, same level of education, and are both given students who collectively are working on the same level. Yet at the end of the year, the results are different. How does that happen? As a freshly minted teacher, I mentally made excuses why my results weren’t like my co-worker. Then one day it hit me . . . all the excuses in the world are not going to help my class. I needed to make a change! The first thing I had to do was set realistic expectations. I had to compare Student A’s first quarter’s reading level with Students A’s second quarter’s reading level. Questioning myself about why this class isn’t reading at the same level as last year’s is not helping my current students. While I know our ultimate goal is to have all of our students on grade level, that may not be a realistic goal. I was very lucky to have some amazing mentors and administrators who showed me that I needed to take my students where they were and go as far as the students were capable of going. I had to make myself vulnerable. When you are the new kid on the block, you are trying to gain your co-worker’s respect. It seemed counterintuitive to ask co-workers for help when you want to earn their respect. I found co-workers respected those who ask for advice. What they don’t respect is someone who comes in with a know-it-all attitude. You’ve probably run across this type of co-worker, too. It’s like he/she never outgrew the teenager rebellious stage. Only now she is rebelling against the veteran teachers because she knows all the latest and greatest things about education and the veterans are “out of touch”. Thankfully this is usually a temporary stage that only a few teachers go through. Some of you may have been thinking about joining the fun of selling your lessons on Teachers Pay Teachers. These tips can be applied to the blogging world. I’m sure if you asked 5 different sellers about their first year on TPT you would hear 5 different stories about what it was like. One of the mistakes I hear new sellers make is comparing him/herself to other sellers. Whether they are comparing themselves to another seller who began at the same time or one of the top sellers, comparing yourself is a double edged sword. I think some new sellers look at top sellers lessons and they copy the top seller’s style much like a student teacher copies the teaching style of their mentor teacher. But, new sellers will rarely become successful by mimicking others. The new sellers that I see blazing a trail up the top 100 list are the ones who find a niche that is all their own with their own style. Just like teachers have to find their own teaching style, you need to find your own TPT style. For me, my first year on TPT was a little like my first year as a teacher. I was overwhelmed with all I needed to know. They didn’t teach a blogging class when I was in undergrad. And they definitely didn’t teach me all I needed to know about copyright laws. The laws are much different when you sell than when you use materials for your own class. Ignorance is not a defense if you are ever sued for infringing on someone else’s intellectual property rights. My knowledge of powerpoint has blossomed this past couple of years because of TPT. I can’t tell you how frustrated I was with all the technological things I didn’t know. I spent 5 hours one Sunday learning how to make a blog button. By the end of time, I was ready to take a sledgehammer to my computer. My experience was a little different than other sellers on TPT. My family moved to California from Chicago because of my husband’s job. The area that we moved to laid off teachers the year before we moved here. The districts weren’t even accepting applications to be a substitute. Suddenly, I was out of work after teaching for 20 years. Teaching had always been my passion. I felt like I had all this knowledge I wanted to share with kids but I wasn’t being given an opportunity to do that. It was very frustrating! Every time my Mom called me I was reorganizing my garage. Thankfully my daughter’s middle school allowed volunteers. I volunteered 10 hours a week my first year here. It mortified my daughter but her teachers were very gracious. Still this didn’t fill my teacher-void. One day I was on Proteacher when I heard about TPT. Finally a way I could make lessons again. This is where my experience may differ from yours if you decide to become a seller. Because I don’t have a teaching job I have more time to devote to making lessons, blogging, pinning on Pinterest, and sharing links on Facebook. This is a definite bonus! But, I think I feel more pressure because this is my only job. When you have a teaching job, a paycheck from TPT is a nice bonus. It is one of those double edge sword situations again. I often see new sellers asking for advice in the sellers forum. This is like the scenario with the 2 teachers above. There are so many variable that affect results. You can have 2 sellers that begin the same month with the same number of lesson packets that have a blog, Facebook page, and Pinterest account yet have different results. If you say these sellers are alike, you have only compared on a surface level. Did they pin the same number of lessons at the same time of day? Did they build a following on the Facebook page the same way? Did they add lessons on TPT the same day? Variables affect results. There is no magic formula and this isn’t teaching. You don’t get paid based on your education level or years of experience. I think new sellers would benefit from taking the 2 steps I suggested above. Step 1: set realistic goals. It would be nice but not realistic to expect yourself to become a top 100 seller within a year. It’s possible but not probable. At the end of the 4th quarter of 2012 there were 1,300+ sellers who made $500 or more. You can read more about that here. A more realistic goal for a new seller would be to sell one lesson packet a week. When you begin selling a few lesson packets a week, up your goal to selling one packet a day. Adjust your goals as needed. Step 2: Make yourself vulnerable. Find a buddy seller and help each other out. Let your buddy look over your lessons before you add them to your store. Is your cover colorful? Do you have typos? With realistic goals, another pair of eyes looking at your lessons, and time your store will gain followers. My friend, Hadar @ Miss Kindergarten shared this graphic the other day. I think it would be a great thing to print off and remind yourself if you have trouble comparing yourself to others. Thank you for this advice. I sometimes wonder how others are able to grow so quickly, but I realized that there are things I still need to do in order to be more visible. It is because of people like yourself that I am learning to be patient and grow at a speed that works with my life. I started TpT, blogging, Facebook, and Pinterest and found that it was too fast for me. I am slowly growing and starting to be noticed. I was excited to get several sales in this quarter. That motivates me to continue to create, blog, and share. I love what I do, and I am humbled to find that others think enough of my products and efforts to want them. I have grown so much in the last 4 months thanks to teacher bloggers such as yourself and the many new friends I have made through this experience. I read your post after I posted my advice, but I definitely agree with you! 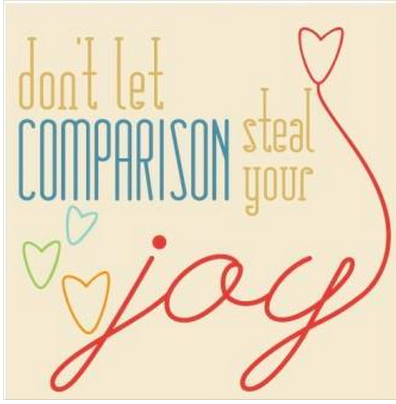 Comparison truly is the thief of joy. So true! I have such a hard time with this, always comparing myself. Good words of wisdom! Love you and your statistical, logical brain!